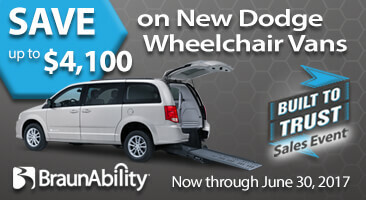 You are looking for a wheelchair accessible van but the options available are overwhelming. BraunAbility offers the most options for vehicle modification, which allows for a perfect pairing between vehicle and owner. However, it can become confusing knowing which configuration is best for you and your needs. A rear-entry wheelchair accessible van has many benefits aside from just cost savings. Its third row of seats has been removed and a ramp installed in the rear. A wheelchair user accesses the interior by opening the back hatch and rolling into the vehicle's cabin. They can ride either in the very back (where the third row would be) or nearer to the middle of the cabin (where the second row is/would be). Toyota and Dodge rear-entry vehicles have the option of a power rear hatch and ramp, which are activated by using your vehicle's key fob. However, there are also manual versions that require the assistance of attendant to enter and exit the vehicle. A variety of seating configurations can be installed to give you seating flexibility. Depending on the number of non-wheelchair passengers in your vehicle, you can include second-row flip-up seats that will accommodate two additional passengers when needed. A rear-entry wheelchair accessible van can use standard parking spaces, eliminating the need to use accessible parking. This can be especially convenient if your area is prone to theimproper use of accessible spaces that may block your entry into or exit from the vehicle. Rear-entry vehicles are typically more affordable than side-entry vehicles simply because they have fewer mechanical and electrical modifications. They are a great option for families or individuals on a tight budget. And now through June 30, 2017, BraunAbility is holding the Built to Trust Sales Event on all new side-entry and rear-entry Dodge wheelchair vans offering savings of up to $4,100 off MSRP! Inventory is limited, so find your local dealer and discover mobility freedom today!